Hello to all my friends in music video land! It’s Andy Gesner and the staff at HIP Video Promo, with an exceptionally hilarious new clip! NOFX, one of the longest-running, funniest, and most consistently-entertaining skatepunk bands in California, has in recent years become greatly influential – and, arguably, even socially important. They’ve done so through Fat Wreck Chords, their own indie label and a major force in the national resurgence of punk rock, and throughPunk Voter, an aggressive campaign to organize and politicize young musicians launched by the band in 2002. None of that would matter as much as it does if “Fat Mike” wasn’t so good at writing hooky and hilarious pop-punk songs, or if he didn’t have such a remarkable eye for new talent. It’s been our great privilege at HIP Video Promo to work with Fat Wreck Chords artists, so we’re thrilled to have the opportunity to bring you the latest clip from the act that started it all. Even at their most insouciant and raucous, NOFX has always been a band with a highly-developed political consciousness. The Bush Administration seems to have sharpened Fat Mike’s wit; recent NOFX recordings have been scathing in their acuity and uncompromising in their critique. (They’ve also been, as always, laugh-out-loud funny).The War On Errorism, released in 2003 as a deliberate intervention in the then-upcoming election, was the most focused set of broadsides against the government Fat Mike had yet penned. He didn’t disband Punk Voter when the national contest didn’t go the way he’d have liked it to, and with the pugnacious Wolves In Wolves’ Clothing, he proves he’s got no intention of standing down. The set takes on the Republican Party, Orange County and the Midwest, organized religion, law enforcement, and any other symbols of authority and conservatism unlucky enough to stumble into Fat Mike’s crosshairs. Of course he also sings about getting blitzed. Odes to intoxication form a sizeable percentage of the NOFX catalog, and onWolves, Fat Mike doesn’t allow his political conscience to stop the party. From one perspective, lead single “Seeing Double At The Triple Rock” is a NOFX drinking song – dizzy on a stool, genuflecting before the bartender at “liquor church”, courting asphyxiation, face down in a whiskey glass. But in the context of Wolves In Wolves’ Clothing, the themes of escapism, self-abnegation, and irreverence take on an entirely different cast. The performance clip for “Seeing Double” doesn’t attempt to dodge controversy. Instead, it’s a full-on religious send-up, complete with a stage-diving Carmelite sister and a sandal-wearing punk-rock Jesus. That said, there’s something innocuous and perhaps even warm about NOFX’s portrayal of the Messiah – the hard-drinking seems positively thrilled to find him in a grungy punk club, and they’re pleased and complicit when he decides to crowd-surf. A bawdy with a girl in each arm looks on approvingly as Fat Mike and his band rocks the crowd, parted down the middle like the Red Sea to let the Big Guy walk through. And as he baptizes the frontman in a vessel containing water that’s something less than holy, just keeps on singing, his words bubbling, defiantly, to the surface. Here at HIP we are so excited to be working with our friends at Fat Wreck Chords to bring you this clip from punk rock icons! We have plenty of copies of Wolves In Wolves’ Clothing, their terrific EP Never Trust A Hippie with two unreleased tracks, and some other NOFX goodies, so don’t hesitate to get in touch! There will also be a NOFX prize giveaway at the end of the video campaign; we will be releasing all of the details to you shortly! The band is going to be headlining the Warped Tour all Summer, so please let us know if you would like to set up video interviews or IDs with NOFX. If you need more info call Andy Gesner at 732-613-1779, or email HIPVideo@aol.com. 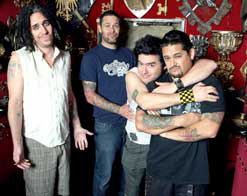 You can also visit www.FatWreck.com or www.NOFX.org to find out more about NOFX.